Trip Description : The Sanctuary of Truth, the magnificent wooden structure is among those "unseen places" in Thailand. For travellers who are interested in art, history and philosophy as well as the heritage of mankind, the Sanctuary of Truth is worth a visit! Name The Sanctuary of Truth, was totally made from wooden carving and this wooden sanctuary is the biggest in Thailand. Establish by Khun Lek Viriyaphan from the ground breaking in 1981. 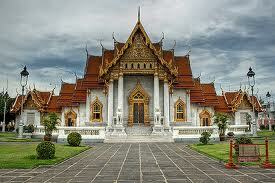 Moreover, he was created the Ancient City and the three-headed elephant Art Museum at Samut prakan Province. Shape A wooden pavilion of 100x100x100 m3. Objective To portray life enlightenment through Eastern philosophy and cosmology. From the Cold War era until today, the world has been under the influence of western civilization , accentuated by materialism and devotion to advanced technology. Many natural areas have been degraded , and men have drifted away from their old values in such a way that morality and spiritual contentment have become irrelevant to many people. Their attempts to control nature have transformed many people into egotistical individuals who are out to destroy one another through incessant wars and economy plundering. Most are after only happiness in this life, and believing that there is no life after this. This sanctuary of truth was conceived out of the vision that human civilization has been achieved and nurtured by religious and philosophical has been achieved and nurtured by religious and philosophical truth. This sanctuary was created not from hubris but from goodness drawn from religion , philosophy and art. Man cannot be born and exist without seven creators. The Sanctuary of Truth presents seven creators through carved wood sculptures which adorn its interior. They are: Heaven , Earth , Father , Mother , Moon , Sun and Stars. On top of the four spires of the sanctuary, the four elements that will lead to the ideal world according to eastern philosophy are presented. For travellers who are interested in art, history and philosophy as well as the heritage of mankind, the Sanctuary of Truth is worth a visit!